Real world is different from the developer machine and testing tools must be used if you want to avoid code failures in real life situations. 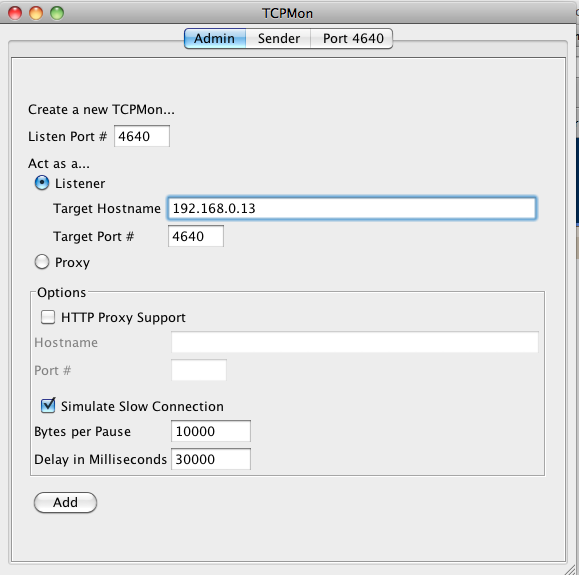 Regardless the programming language you use a TCP proxy with delay capability is the tool you need to look for. 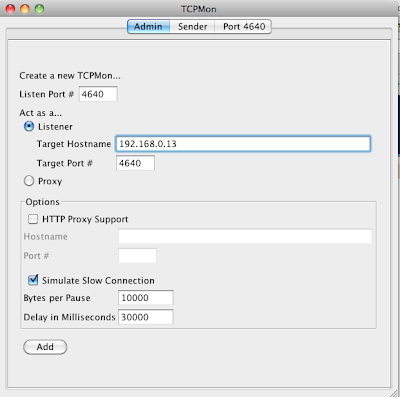 Axis (not Axis2) comes with such a tool named TcpMon. The tool is maintained our of the Axis project nowadays. You can download it from here. As the tool is developed with Java you can run it in any OS. Below is a picture of it configured to wait 30 seconds after each chunk of 10KB transmitted, listening in localhost port 4640 and intercepting request and responses going to and from 192.168.0.13 internal IP. This post came as a result of some hours debugging slow responses that my SOAP was experimenting. The above does not address the problem of slow packets or servers just performing to many operations before sending back the whole SOAP response. Ideally there would be a way to tell the client just to timeout if the whole operation takes too much time. I thought this could be achieved accessing HttpURLConnection.setReadTimeout() and that made me post the question in the Axis2 Forum. After seeing some people visiting the post but actually not replying I felt like I had to hack deeper in the code and so I did. 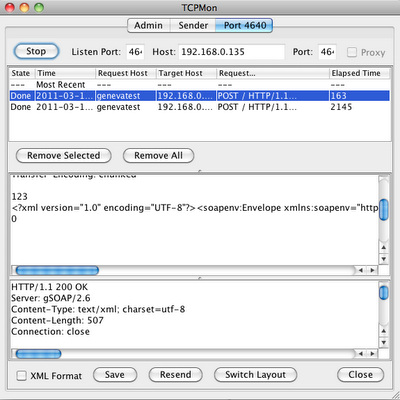 Axis2 uses Commons Http Client library and that one just has support for socket and connection timeouts. This is probably right approach if we talk about TCP but I think when it comes to HTTP, handling timeouts when data takes too long over the wire is a must have. This as a common problem to be solved: You do not want your client side to hang waiting for slow server responses. Ideally the client should timeout in circumstances like slow network throughput, high latency and so on. I ended up using concurrency to solve this issue. A Callable task does the job and if the task does not finish within certain amount of time the Callable task is killed. This is easily done through the use of an ExecutorService.